Doug (David Tennant) and Abi (Rosamund Pike) are about to hit the road with their three children. They are off to Scotland for Doug’s dad Gordy's (Billy Connolly) 75th birthday party. A long car trip is hard enough, but Doug and Abi have a secret that is adding to their stress. They have recently separated. However, they don't want to tell anyone for fear of ruining the party and upsetting Gordy, who is terminally ill. The family is staying with Doug’s uptight brother, Gavin (Ben Miller) and his wife Margaret (the brilliant Amelia Bullmore). The brothers have a strained relationship - especially when it comes to the well being of their father. For his part, Gordy far prefers the company of his straight-talking grandchildren to that of his squabbling sons. The scene is thus set for an eventful weekend - one that no one will ever forget. What We Did On Our Holiday is based on the family from the successful BBC television comedy, Outnumbered. The show’s original cast couldn’t be used in the film because the children had become too old. As a result, we now have David Tennant and Rosamund Pike as the likeable central parents in the story. Both give great comedic performances. Tennant is particularly engaging as he deals with the collapse of his marriage, the demands of his precocious children and his father’s illness. The family’s journey up to Scotland did make me laugh. It features elements of family car trips that I am sure we can all recognise. Once safely installed in Gavin’s impressive, yet suffocating home, I was charmed by Billy Connolly as Gordy. Often larger than life, Connolly’s is a quiet and reflective performance in this film. He manages to connect with his grandchildren in a heartwarming and hilarious way. After introducing a narrative full of family strife and conflict, What We Did On Our Holiday takes a rather dark turn - one that was both surprising and rather off-putting. After that, the film, while still likeable enough, lost me. I found that I didn’t care enough about the central characters, the film wasn’t nearly funny enough and that no one was behaving in the way they should, particularly given the circumstances. The exception to this was Bullmore’s Margaret, who I loved throughout this movie and wanted to see much more of - the scene with the CCTV is hilarious. 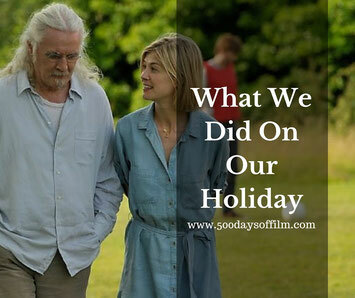 What We Did On Our Holiday is a quirky comedy about the complications that lie behind the closed doors of every family. However, as much as I wanted to love this film, in the end , I found it uneven and unsatisfying. Have you see What We Did On Our Holiday? If so, what did you think about this film?